With numerous and violent interruptions throughout its history, A Batalha is today among the continent’s oldest anarchist newspapers. A Batalha: 100 years of struggle for a world without exploited and exploiters, without oppressed and oppressors! 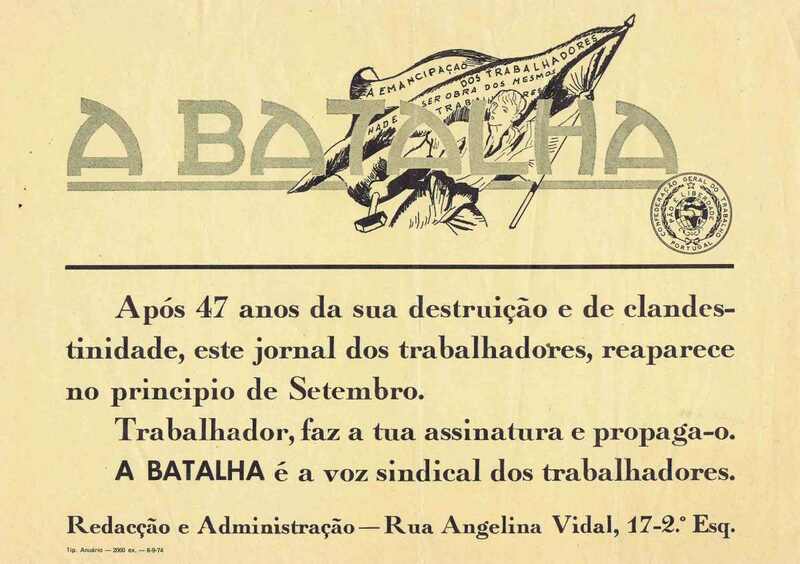 The 23rd of February marks the centenary anniversary of the first number of the newspaper A Batalha, “voice of the organised worker” and from September of 1919, date of the foundation of the CGT, organ of the anarcho-syndicalist labour union. Alexandre Vieira, tipograhper, was its first director. During this period, A Batalha saw on many occasions its offices invaded by the police, editions seized and its journalists arrested, but it will continue to publish until the 27th of May of 1927, when the police invade its head office (on the Calçada do Combro, in Lisbon), ransack and destroy all the equipment, after which the newspaper is prohibited. Its last principal editor is Mário Castelhano, who years later, will die in Tarrafal. MBetween December of 1923 and January of 1927, A Batalha also published a literary and illustrated supplement where many of the most noteworthy intellectuals, writers and journalists of the time collaborated (see below). Though independent of the newspaper, between the 2nd of July of 1925 and the 15th of June of 1926, the bi-weekly magazine Renovação, sub-titled Revista Quinzenal de Arte, Literatura, e Actualidades, was also published. It belonged to the workers’ newspaper A Batalha, and was closely tied to the ideals of anarchism, defending the revolutionary sindicalism advocated by the Confederação Geral do Trabalho (C.G.T.). Many of its collaborators also collaborated on the Batalha and, among them can be found important 20th century literary figures of the country, such as Ferreira de Castro, Rocha Martins, Emílio Costa, Julião Quintinha, Ladislau Batalha, Mário Domingues, Augusto Pinto, Nogueira de Brito, Jaime Brasil, Bento Faria, David de Carvalho, Eduardo Frias, Cristiano Lima, including illustrations by Stuart Carvalhaes and Roberto Nobre. 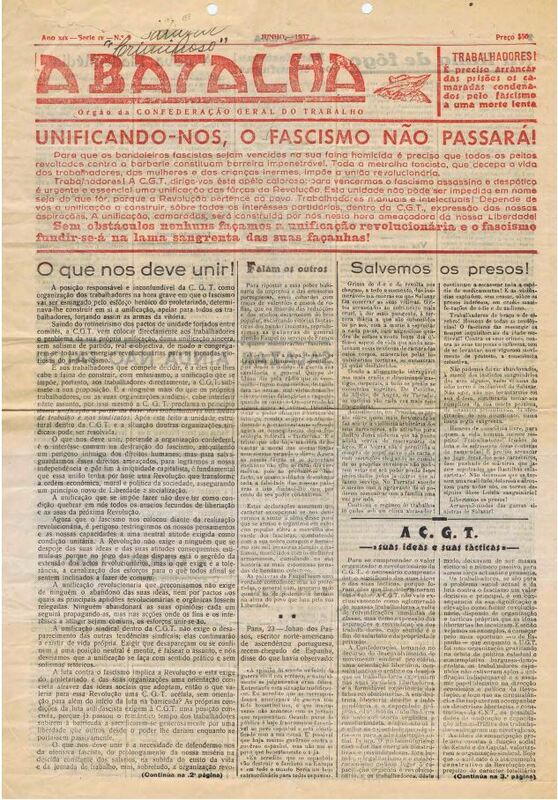 During fascism, A Batalha was published for long periods in the decades of the decades of the 1930’s and 40’s, in clandestine printing shops (namely, in a cave in the Lisbon neighbourhood of Alcântara), calling for the re-organisation of militant revolutionary syndicalists and anarchists in the struggle against the Salazar regime. In the National Library, there is a record of the following clandestine editions: nº 1, Apr. 1934- a nº 10, Jul. 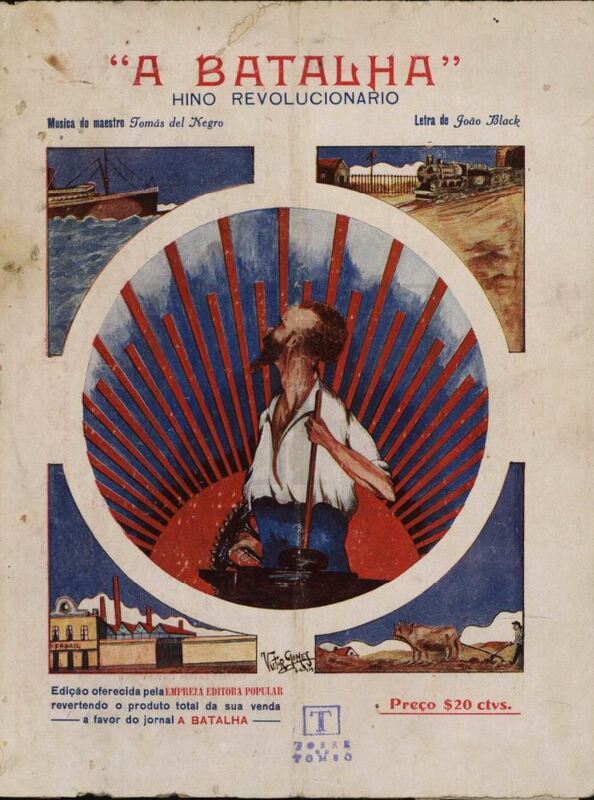 1937; nº esp. Dec. 1944; nº 1, Jan. 1946 a nº 21, Dec. 1949. A Batalha began to appear legally once again after the 25th of April of 1974, at the initiative of a group of militant anarchists and anarcho-syndicalists, headed by Emídio Santana and other old activists of the CGT (some of them had also been responsible for some of the clandestine editions of the newspaper). 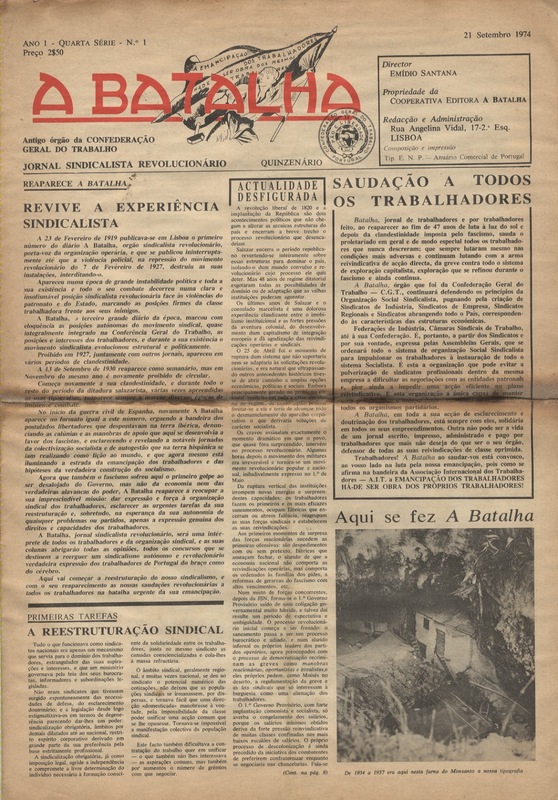 The first edition of the new series of A Batalha came out in September of 1974 as a bi-weekly, with Emídio Santana as its director, becoming then a monthly, and today it is published every two months, with João Santiago as director, no longer as an anarcho-syndicalist or revolutionary syndicalist newspaper, but a newspaper of anarchist expression. In the period after the 25th of April, A Batalha had its head office, just after the military coup, on Angelina Vidal Street, in the Graça neighbourhood, moving then to D. Carlos I Ave., in São Bento, and, later to Álvares Cabral Ave., near the Largo do Rato. Currently, its office is located in the Olivais neighbourhood of Lisbon. On this anniversary, it is important to emphasise the necessity of making available the totality of the A Batalha collection between 1919 and 1927 (already digitalised by the National Library), along with the clandestine editions, on the internet, to all activists and researchers. It is a common heritage, fruit of the labour and dynamic of many men and women, and not something to be restricted to a half-dozen academics.